Magic performed by a First Class restaurant magician is the secret ingredient on your menu, which helps to make your restaurant eateries a success. Darryl uses his table magic to make an impression on your customers, so they want to come back time and time again gaining you valuable customer satisfaction. Using knives and forks, salt & pepper pots, cards, money and wine bottles, everything that Darryl needs to perform his restaurant magic is normally on the table, so his magic is self contained.Imagine borrowing a coin then penetrating it through the wine bottle on the table! 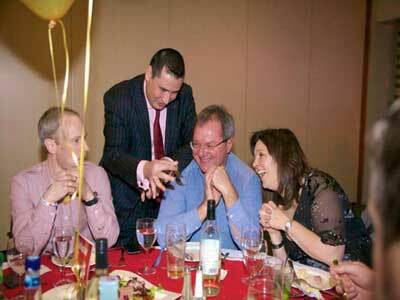 Amazing magic from an amazing restaurant magician! Restaurant magician Darryl has been performing around the world for over 25 years with his unique, creative and entertaining magic. He’s performed all over for royalty and rock stars, politicians and public, and his approach to magic has earned him being a Member of The INNER Magic Circle with GOLD Star – The highest Accolade a member can achieve. He is also a Life Member of The Magic Circle, and a Member of The International Brotherhood of Magicians.